Has The Avengers Project Been Shelved? Tonight was both a night of entertainment and disappointment. The Game Awards put out a solid show, awarding our beloved video games with the recognition they rightfully deserved. Fans cheered and the audience applauded with equal enthusiasm. There was a certain section of the audience though that was keeping their eyes out, expecting news about a project that since its announcement has captivated the most ardent of Marvel fans: The Avengers Project. That news didn’t arrive. Set to be a AAA big-budget game developed by Crystal Dynamics, a subsidiary of the well known game studio Square Enix which was responsible for the development of this year’s Tomb Raider, the game was announced with a short gritty teaser that showed the Avengers’ weapons in disarray and circumstances calling them to reassemble in the face of an emerging threat. The game, since known only as The Avengers Project has seen little news emerge about it since, with not even a still to go by. We’re committed to delivering an incredible, completely original Avengers experience to our gamers, and that means we are always looking to add amazing developers to our existing best in class studio talent. As development progresses, our studio continues to grow. The tremendous progress we’ve made on The Avengers project further drives us toward our goal of crafting something all Marvel fans will be proud of, and will play for years to come. We can’t wait to show you what we mean in the future. Then, nothing. There was no showing or footage at E3 2018. Briefly, some flutter was caused by a response reportedly by Shaun Escayg, who joined the studio bringing his experience from Uncharted: The Lost Legacy. 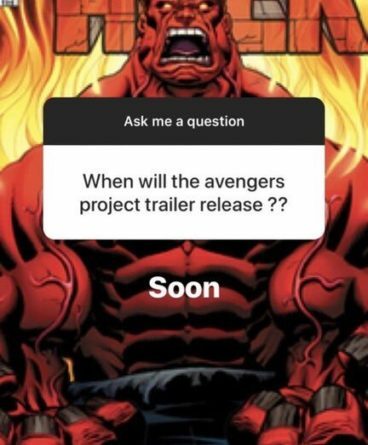 In the snapshot, taken from an Instagram story, when probed about a trailer for The Avengers Project, he said “Soon”. Then, nothing. That soon never arrived. Not last month, and not yesterday when the Russo Brothers arrived at The Game Awards. Despite the remarkable progress made by the studio on the game, as it has hinted, the general audience doesn’t get to see any of it. Could it then be possible that the game has been shelved? That The Avengers Project was proving to be way too ambitious for its developers, resulting in its cancellation? Or are there financial troubles brewing within the studio that could have led to its cancellation? In the video game industry, it’s highly unusual to not hear anything about a game when it’s almost 2 years since its first teaser dropped, which itself wasn’t any gameplay footage. Then again, it’s highly possible I’m wrong on this. That the studio is just taking the time to perfect and polish their game to their insanely high expectations and it’s possible that certain elements and gameplay mechanics are proving to be challenging to get right. With multiple heroes comes the need to incorporate multiple combat and playing styles which might be partly contributing to the delay. Or it’s possible that the game could be somehow tangetially connected to Avengers 4 and could run the risk of spoiling some elements of the movie if revealed. Finally, Marvel being notorious for its secrecy, as we’ve seen with the Avengers 4 trailer and title, it’s quite plausible they’re extending this behavior to their gaming IP as well. So has the project been shelved, cancelled or delayed? I’m unsure about the first two but definitely positive about the latter. At best we can hope that The Avengers Project will have some presence at next year’s E3 2019, which should be a month after the release of Avengers 4.